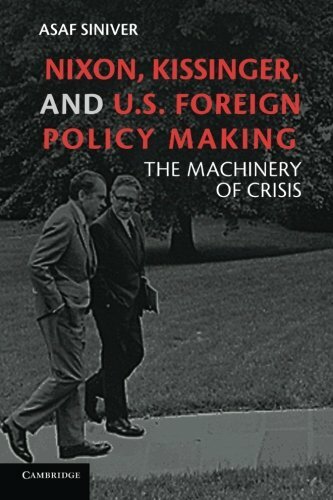 Nixon, Kissinger, and US Foreign Policy Making examines for the first time the important role of crisis management in the making of US foreign policy during the Nixon-Kissinger years. The book offers a critical account of the manner in which the president and his national security advisor - notorious for their tight grip on the machinery of US foreign policy - dominated the structures and processes of foreign policy making. By drawing on a wealth of previously classified documents, Asaf Siniver reveals the story of the Washington Special Actions Group (WSAG), which managed foreign policy crises in the Nixon administration. 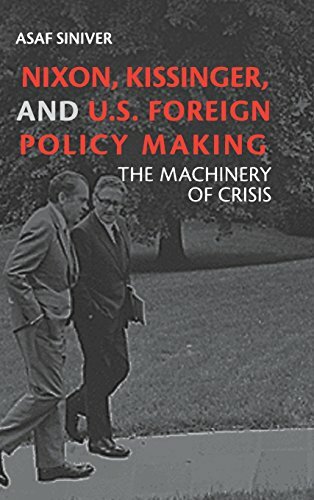 In this thoroughly researched account of the performance of Nixon, Kissinger and the WSAG in four international crises, Siniver provides a fresh analysis of the important relationship among structures, processes and personalities in the making of US foreign policy during international crises. Siniver examines the workings of the Washington Special Actions Group during four Nixon-era foreign policy crises. His examination of previously classified material about the group reveals much about the linkage between structures, processes and personalities in crisis decision-making.